If you came here looking for board game reviews, then this page is for you. I usually review games after 1 or two plays. Why? Because if it takes more than that to determine if it’s any good, most people will have given up and won’t try it again. Designer’s gotta design games that work well the first time someone play’s it. Otherwise it won’t be a game with a big audience. Three more title are being crossed off The List! While I didn’t play all three I wanted to remind you of the criterion for crossing a game off the list. A game shall be crossed off when at least two of our core group of 4 have played the game. So while I own games that I have played, they might still be on the list since they do not meet the criterion. Also, since I did not play Patchistory or China I am bringing in A-Game and J to share their perspective. But let’s start with Rome: City of Marble since I have now played it twice. I love this game. I loved it in prototype form and I love it in final production. I am friends with the designer, Brett Myers. The way he designed this game to utilize rhombuses is intriguingly clever. In Rome: City of Marble players have two actions per turn. Their objective is to build the city of Rome. This is done by obtaining and placing rhombus shaped tiles onto the city map. Whenever a hexagon shaped intersection between tiles is completed, a building or a fountain is placed at that location. If a player have influence over that location by having their magistrate on the correctly colored tiles, then they claim that building. If no player has influence it becomes a fountain. Over the course of the game players earn points by completing buildings, having proximity to fountains, being connected to aqueducts, and more. I like that the balance of scoring is about 50/50 in-game versus end game. So you don’t know exactly who will win unless you are an uber nerd who crunches the numbers after every single action taken in the game, which kind of takes the fun out of any game, so don’t be that person. Overall I am looking forward to playing Rome: City of Marble many more times. China is an old school euro. An old school euro to me is a collection of rules, mechanics, and scoring that drive the players to difficult or interesting decisions but do not embrace the ‘theme’ of the game. In China there is a network of roads and towns on a board and the board is divided into areas. On your turn there is basically one action you can take (placing pieces on the board) and the action is limited by various rules (the three cards in your hand plus rules about how many pieces can be placed). The scoring is tied to having a majority in an area and having a majority across two bordering provinces. I like old school euros because they are usually easy to learn and teach and don’t often take more than 1 hour to play. However, they are almost always lacking a theme that is well integrated with the mechanics. This game fits both of these conditions to a tee. The game is easy to learn, teach, plays quickly, and has some good decisions. However, the only reason it’s called China is because that is the graphic they chose to put on the board. The interplay of mechanics and scoring is clearly front and center here and that’s ok by me. Old school euros have a lower ceiling and higher floor for me. I don’t typically have great gaming experiences with them but I’m also rarely disappointed by them. If you need a recommendation for an old school euro that delivers a really good experience I suggest Taluva. If you’re looking for another collection of mechanics and scoring conditions consider China; it will meet those expectations. I was looking forward to playing Patchistory. So I was glad when we brought it out for a three player game night. The focal point of the game is a patchwork map building mechanic. Each round, players bid on terrain tiles that provide different resources. These tiles are placed overlapping so you have to cover part of one tile in order to play another. Mixed into the terrain tiles are great leaders from history and architectural wonders. These tiles are permanent, so you can’t later over them. It was a cool mechanic that presented some very interesting decisions. If the game was primarily centered around the map building, I think I would have really liked it. Sadly it was not. The remainder of the game consisted of bookkeeping and a long list of potential actions you can take each round. All the actions required the same resource (political points) so politics became the most important resource. If you don’t have a lot of politics, you can’t really do much. The actions themselves often felt uninteresting or unimportant. The only one that stood out to me was the ability to offer aid to your neighbor, which they can accept or reject and you score points either way, giving you the opportunity to offer something you know they will reject, so you can score points at no cost. As the game goes on, the terrain gets more powerful, but the actions get more expensive, so it is basically a wash.
On the whole, the game had a few bright points, with a lot of fiddly bits in-between. I’d like to thank A-Game and J for contributing their reviews. We’ll keep it up as the year progresses and we continue to cross games off The List. Thanks for reading! I recently played Mad City, a new release by Mayfair Games in their Fun Fair line. This game also happens to be designed by a local designer. Kane Klenko is the designer and you can read his Designer Diary on BGG. Today I’ll review the game. I have played it three times. Mad City lasts a variable number of rounds. In each round players have 9 tiles and they will have one minute to build their city by arranging the tiles in a 3×3 grid. All tile placements are allowable. After the minute is concluded players may bid if they believe they have the largest group in one of four categories: Residential, Industrial, Urban, and longest Road. If players bid and have the largest, they will earn 3 bonus points. If they bid and do not have the largest, they will lose 2 points. There is also a park ranger tree which can be taken by any player (unless that player already has 50 points or more). Once you take the tree you cannot rearrange your city any longer. However, if you have parks or ponds in your city you will earn more bonus points by taking the tree. For example, if you built a section of the city with 4 residences (yellow) in it you would rotate the yellow pentagon (which is for 3-6 residence sized groups) clockwise, which would result in the “4” being at the bottom. The number by the arrows represents how many of those size groups you need to build before the scoring tile flips over. Once the scoring tile is flipped over it will then allow you to score points for those size groups. It is beneficial to try and get your scoring tiles flipped over early on so that you can score faster than the other players. The round during which someone scores 100 points is the final round. The player with the most points wins the game. Fast Play: This is a game that doesn’t take any longer with more players or shorter with fewer. It is basically a race against the other players and each round takes only a few minutes. You can play with up to 6 players and there is minimal downtime. This isn’t a turn based game. You are racing. A minute is the perfect amount of time to try and build your city to score loads of points. Scoring Mechanic: I think the scoring mechanic of having to build smaller groups to get your scoring tiles flipped over rather than just building the largest groups possible adds a great layer of strategy to the game. I especially like how it creates a natural acceleration in the game. The first few rounds you can feel like you are making little to no progress. But all of a sudden your scoring tiles will be flipped and you’ll be able to rake in the points. It is a very clever mechanic and it works really well! Sand Timer: It has been reported that several people have received sand timers in their copy of the game that are either short or long. One such account reported their timer only ran 25 seconds. This is a quality control issue from the sand timer manufacturer. If you have had problems or noticed your timer isn’t very close to one minute, I imagine Mayfair Games can help you out. (Mayfair Contact Page) Sand timers aside, I recommend using a timer on someone’s phone so that no one has to watch the timer. Plus, phones make a noise that all players can hear so everyone knows when the minute is up! I struggled trying to think of something I would change with this design. It is a really elegant and simple design that is accessible, family friendly, and fun. Perhaps what I would change are the scoring tiles. After a half of a game they’ll make sense, but up front they can feel a little daunting. One option would be to have tracks on your player score mat. Then every time you complete a section of buildings you slide the marker cube over for the section of that size. When it is all the way to the right then you can start scoring that category. This, however, would likely cause the cost of the game to rise since cubes are more expensive than chits. But that’s what I would change to make the game slightly simpler to learn. Kane is a local guy and I get the feeling that Mad City is perhaps named after Madison, Wisconsin’s nickname of “Mad City.” With that in mind I feel the best pairing would be a local beer by the name of Mad Town Nut Brown by local brewery Ale Asylum. Bruges is a city located in northwest Belgium. It is also a game by famed designer Stefan Feld. And today I am reviewing it for you. Disclaimer: I have only played Bruges twice, but I review games after one or two plays because I usually won’t give them another shot if I don’t like it after two plays. Bruges: Is this another Feldian Point Salad? Bored Europeans on the cover of another Euro game. In the game Bruges players will try to win by garnering the most points. Players will attempt to earn points from buildings, people, canals, and reputation. The game is played until one of the two card decks runs out. Each round players will draw to a hand limit of 5 cards. Then they will play four turns each where they are choosing from the actions above. There are many choices to make during a game of Bruges. From choosing which deck to draw your cards, to deciding whether to go for canals or houses and people. The decision space in this game is immense and yet it is limited. How can I make such a statement? The reason I make that proclamation is that with the 5 cards you have in your hand each turn, each card presents 6 options. So there are 30 things to decide from in each round. That’s a lot. But on the other hand, you will likely not actually be choosing from those 30 things. You will likely be choosing from a subset of those options based on the gameplan you have. So while there are plenty of decisions you could make, you are probably going to choose from a few of the options available to you. Also, the threats in the game can steer some of your decisions, which can be frustrating and relieving at the same time. Bruges plays 2 to 4 players in about an hour. It has a bit of a learning curve, but I think it fits the Feldian mold nicely. OPTIONS: I love options and a large decision space in games. I don’t love when decisions are made for me. Bruges allows me to have the liberty to play just about however I want. I can play as dumb as an ox or as brilliantly as a fox. Feld has made an open decision space where players have full control of their gameplay. MULTIPLE-USE CARDS: I like when a designer or publishing company can provide multiple ways for components to be used. As I mentioned above, each card can be used to do any of those 6 options. That’s pretty cool. STRUGGLE FOR SUCCESS: Though you get four turns in a round to do stuff it usually feels like only two of those turns move you forward. Often you are using turns to discard a threat or to take two workers. These don’t feel like fulfilling actions in the game. And that can be frustrating. STRUGGLE FOR MAJORITIES: There are 12 points available if you can gain the majority in the categories of people, canals, or reputation. That’s a pretty cool thing. What’s not cool is that it can be very difficult to gain the majority from someone who already has it. That can be frustrating. While emotion in games is a good thing, negative emotions should be limited. Struggling for the majorities invokes negative emotions. This change alone would open the game up quite a bit, make it less frustrating, and allow players to do more while not changing the overall feel of the theme of the game. I think I’m going to try this as a house rule next time I play! Being that the game is based on a Belgian city I have not choice but to pair it with a Belgian beer. And since I like the game quite a bit I’ll pair it with a Belgian beer that I like quite a bit. That beer is Duvel. 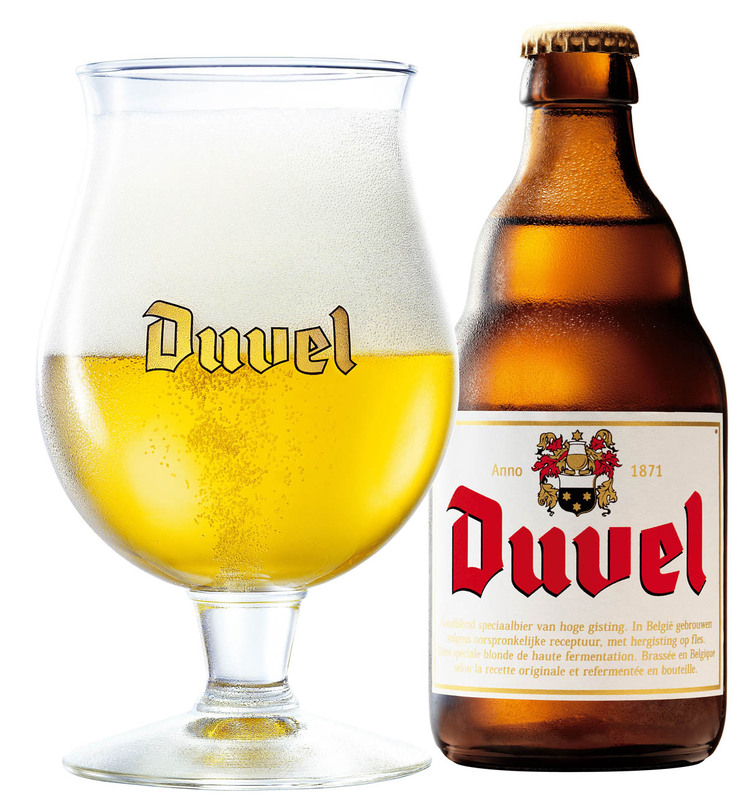 Duvel is a full bodied lager that is refermented in the bottle. It is hopped with Saaz-Saaz and Styrian-Golding hops. It weighs in at 8.5% abv, so don’t drink too much at a time. The next time I play I’ll try to make sure I enjoy the game with a bottle of Duvel! I am a fan of Feld’s games. My favorite is The Castles of Burgundy. Bruges offers some pretty interesting gameplay, but some elements seem more mechanical rather than thematic. On the whole, this is definitely not the typical point salad that some other games can be. This game requires some work to put together a good number of points. In typical point salad games, everything you do gets you points. That’s not the case with Bruges, and I count that as one of the game’s strengths. This is a game I can see myself playing multiple more times. I’ll rate Bruges a 7 out of 10 on the BGG scale. Good game, usually willing to play.